The astute clinician and patient can not assume the maxillo cranial complex is level when there exists hypertension in the masticatory muscles. Muscle can skew and torque the underlying bones, thus the maxilla/cranium as well as occiput and cervical spine may not always be balance. 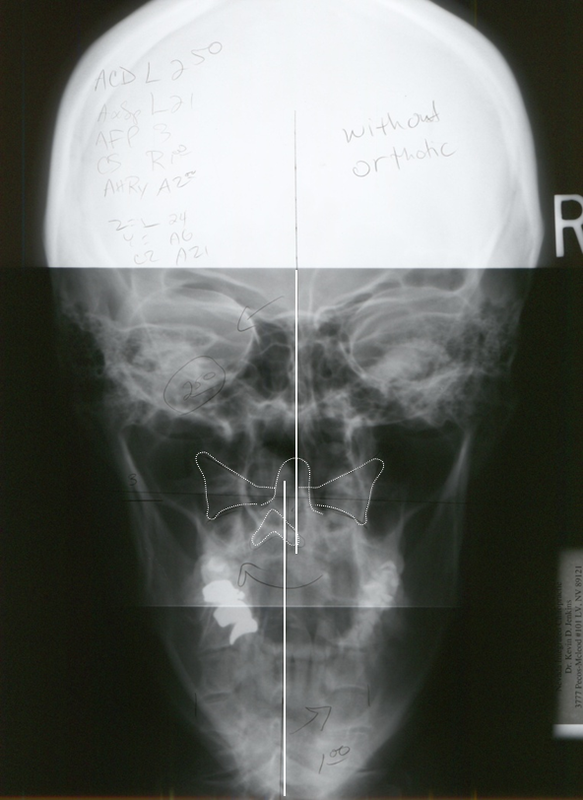 If the mandible is out of balance them most likely all the other bones mentioned and more will also be out of balance. This why it is important to find a stable mandible to maxilary relationship in order to establish a proper occlusion whether for phase I TMD, orthodontics or restorative occlusal dentistry. Note: the cervical neck does not align with the atlas (C1 – outlined) and midsagittal plane. 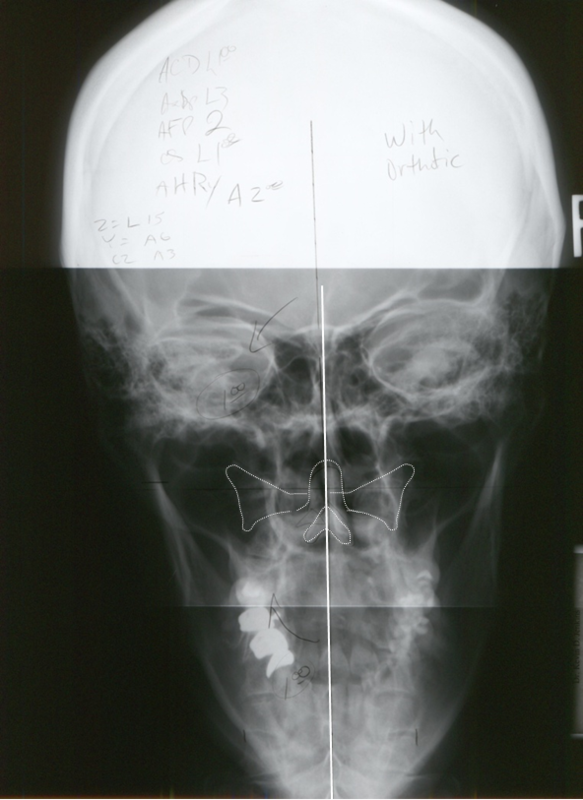 Note: Atlas (C1) now aligns with midsagital plane of cranium and cervical processes. What this also indicates is that the positive effects of an optimized mandibular to maxillary relationship and GNM occlusion significant contributes to these changes. Cranial and cervical mal alignments do not stop displaying themselves in the upper sections of the head and neck regions but will continue to extend themselves as underlying postural distortions and mal-alignments throughout the body system (head to toe). If one part of the body system is out of alignment other parts of the postural system will be out of alignment. The masticatory system (occlusion) is key to re-establishing and maintaining the overall bodies postural system. I believe stability of all the postural distortions including cranial begins with a good quality bite relationship between the upper and lower arches (establishing a terminal stop). Secondly, create freedom of entry and exit from this terminal stop position so the mandible can function freely. When the muscles are happy, the cranial and postural distortions begin to unravel. Hyperactive muscles as you know create havoc on underlying bones, thus contributing to abnormal posture. This is why GNM optimization protocols are important. An interesting and informative read: Kjetil Larsen, Vestibular impairment and its association to the neck and TMJ, Juli 22, 2018.